Rainy Days and Mondays Always Get Me Down! Except When I Am Shopping! You're on the Gold Coast for a holiday and its raining! It isn't the end of the world! After all there is always shopping! Knowing where to shop on the Gold Coast when it is raining! Don't worry, I'll soon have you smiling and enjoying your shopping in the rain! After all retail therapy is good, rain or shine! There are two ways to look at shopping when it is raining! Both equally valid, you will have to chose for yourself! to get rid of those rainy day blues! Hunt for bargains and a less busy shopping opportunity! Personally, I am a fan of the less busy version. I tend to go to the places where no-one else goes! But if I have the kids, you will find me in the dry shopping centres! Marina Mirage stands out from the crowd as being different from the standard big Australia shopping centres, but is not everyone's taste. 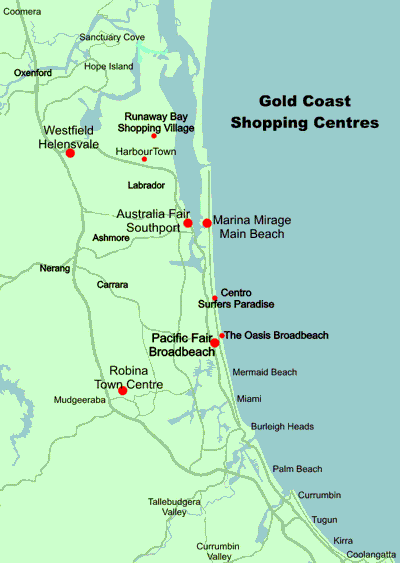 Pacific Fair, Australia Fair, Westfield Helensvale and Robina Town Centre are by far the largest shopping centres on the Gold Coast. You will find combinations of the usual Australian brands. Harbour Town offers outlet shopping with a wide selection of local and international brands. Not much undercover here, so falls into great for the bargain hunters on rainy days! If you are after outlet shopping you have to be prepared to get a bit wet, but there may be even better bargains for those who venture out! This map gives you a rough idea where selected indoor shopping centres are. Not all shopping centres are listed, just a few choice ones! Click on the map or the links below to discover more about the larger shopping centres. Note: Harbour Town is NOT an indoor shopping centre - you'll need an umbrella and be prepared to get wet! Marina Mirage at Main Beach. A boutique shopping centre. Surfers Centro is right in the heart of Surfers at the beach end of Cavill Mall. A range of specialty shops and also access to Timezone, Shooting Gallery and Indoor bowling. So not a bad spot for some shopping and some other entertainment. 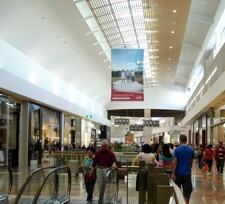 The Oasis is on Broadbeach Mall and has around 140 specialty stores plus a Woolworths. Runaway Bay has a combination of indoor and outdoor shopping, but the major shops are in the indoor section. There are around 130 specialty stores plus a Coles, Woolworths, Best & Less, Target and Big W.
I find the outdoor shopping centres are quieter on wet days. If visitors go and don't realise what it is like, they soon get grumpy and leave especially if they are not prepared for it. A good raincoat, umbrella and some closed in shoes in the winter will prepare the real bargain hunters for a great day of shopping and maybe even some extra discounts if you are lucky! The shops are laid out around open air malls. If it is only raining a little you are probably able to skit between shops fairly easily. When it is pouring, take your opportunity. I hate crowds, so this is when I shop!!! Rainy days or not, Harbour Town is great for outlet shopping, but if you are after the convenience of buying from a department store or you are looking for anything other than fashion (clothes and homewares) then best to try somewhere else. If you are heading out to Harbour Town don't forget to sign up for my HarbourTown Special offer. You will be able to get some extra special bargains on the day. Pacific Fair is huge, and you get the best of both worlds with some indoor and some outdoor. Make sure you are prepared for the wet if visiting on rainy days. Planning A Holiday Should Be FUN! I've lived in & around Gold Coast since 2004. I'm here to help. Use this website to get all the information you need to plan your perfect Gold Coast holiday, or simply click here to find out more about my planning cheat sheets, tips & and tools to make it easier!